The apricots are winding down. The last time I visited my special tree in my friends' front yard, everything within reach was ripe, and I picked it. 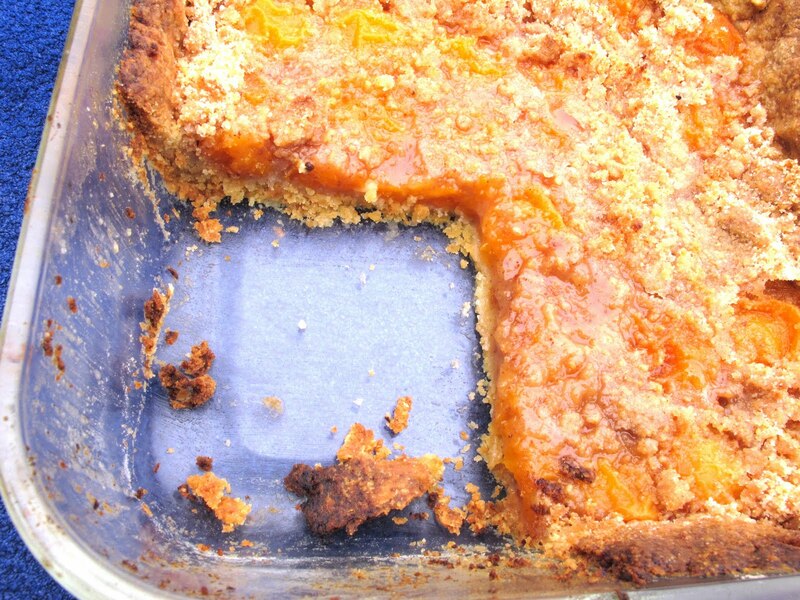 To celebrate (or perhaps mourn) the end of the season, I made a simple apricot tart with almonds. Well, not almonds exactly - almond butter. In a flash of inspiration prompted by the realization that I'd used up two pounds of butter in the past week, I decided to make a thin crumble-like topping using just almond butter, sugar, and a bit of flour. I'm told it was a spectacular combination. I didn't eat any myself, as, sadly, I'm currently trying to cut back on sweets and starches - doctor's orders. But I watched the tart disappear in my office. It was gone in less than five minutes, so I'm assuming it was all right. 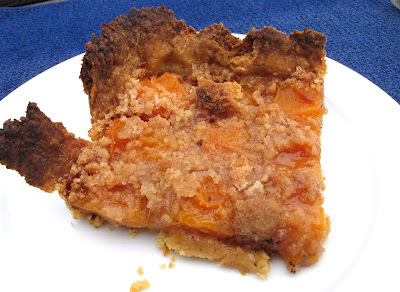 Note: The crust is borrowed from Amanda Hesser's mother's peach tart, which appears in her wonderful memoir Cooking for Mr. Latte . Don't be put off by the use of olive oil - it makes a very flaky crust with a rich flavor. Also, if you use unsalted almond butter in the topping, add a pinch of salt when mixing it up. 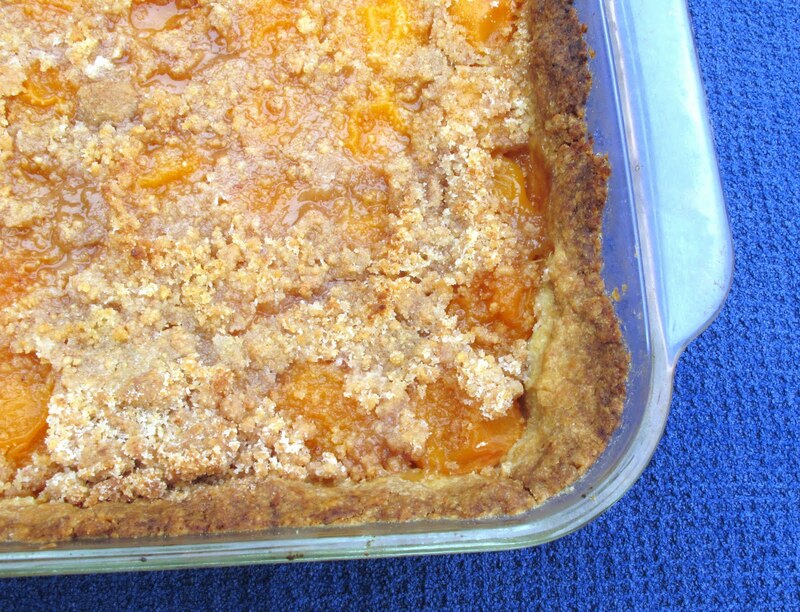 In an 8-inch square baking pan, stir together 1 1/2 cups flour, the salt, and 1 Tbsp sugar with a fork to combine. In a measuring cup, mix together the olive oil and milk. Pour the liquids into the baking pan and use the fork to mix the dry ingredients with the liquids, stopping when the dough has just come together. With your fingers, press the dough over the bottom and up the sides of the baking pan. 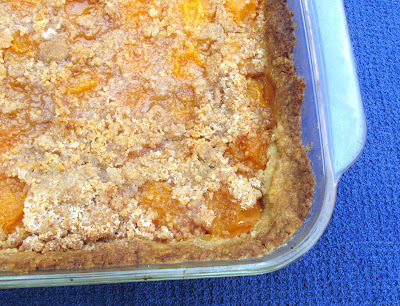 Lay the apricots cut-side down in rows over the dough in the pan. In a small bowl, mix together the remaining 3 Tbsp flour, the remaining 1/4 cup sugar, and the almond butter with your fingers. Work them together until the mixture looks like wet crumbs. Drop this over the apricots evenly. Bake the tart about 40 minutes, or until the edges of the crust are golden and the apricots are juicy and bubbling. Cool to room temperature before slicing. Thanks Shirley! I have never done a GF tart shell but someday I might have to, and I know whom to call! This sounds and looks very good. The flavour combination of apricots and almonds - yum! Isn't it great to have friends with fruit trees? Thanks @momgateway @Sarah and @marla for the compliments! I don't know about genius, but it sure did taste good. @Christine and @Amy I went a little nuts with the Foodista widgets - I think I added a half-dozen to various posts...will try to get in the habit. I add foodista widgets in my blogs too even the semi-food related. a lot of people visit my site when i started using the widgets. And it's helpful too! I actually found your blog because of the widget. =) looking forward to more of your blogs!